We had such a blast in Waynesboro, VA celebrating our wedding anniversary. We went hiking, ate delicious food and enjoyed the local wineries and breweries. Isaac and I recently celebrated our five year wedding anniversary! Five years is a big one – so we ended up doing two celebrations. 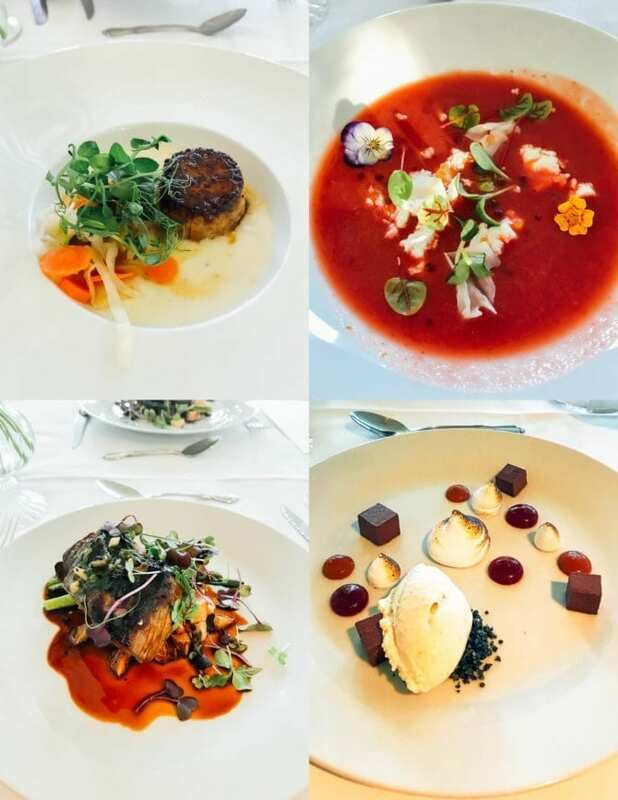 The day of (June 15th) was a Friday, so we made dinner plans at Lemaire and had a lovely dinner that evening. 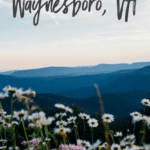 Later in June, we planned a trip to Waynesboro, Virginia, which is only a short drive from Richmond, Virginia and located right in the middle of the beautiful Blue Ridge Mountains. We stayed in the cutest little cabin at Iris Inn and, other than booking our cabin, we didn’t really have a specific itinerary planned before the trip (we’re spontaneous at times!). 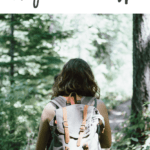 We knew we wanted to go on a couple hikes, visit a few breweries and wineries and just relax. And that’s exactly what we did. The cabins at Iris Inn are so cute and cozy. I really want to revisit in the fall/winter so that we can fully take advantage of the hot tub, fireplace and heated bathroom floors! We arrived on Thursday evening and decided to keep things low-key on our first night. We made dinner at our cabin with food we brought from home, hung out in the hot tub and popped a bottle of champagne to kick off the long weekend retreat. On Friday morning, we ate breakfast at the Inn before heading out for the day. The Inn serves a full breakfast menu included with your stay, so we made sure to take advantage of this every morning. Despite having coffee with breakfast, Isaac and I decided to swing by a local coffee shop for added energy (thank you, caffeine) before our hike. Can you tell we’re coffee lovers? Whenever we visit a new city, we look up local coffee shops to check out! 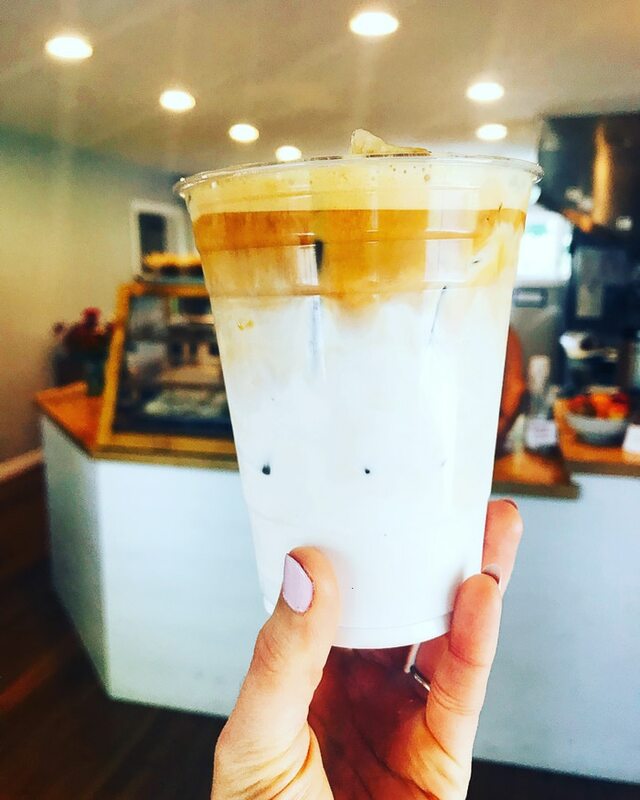 Waynesboro has a super cute farmhouse-turned-coffee-shop called Farmhaus that serves coffee, breakfast and lunch. 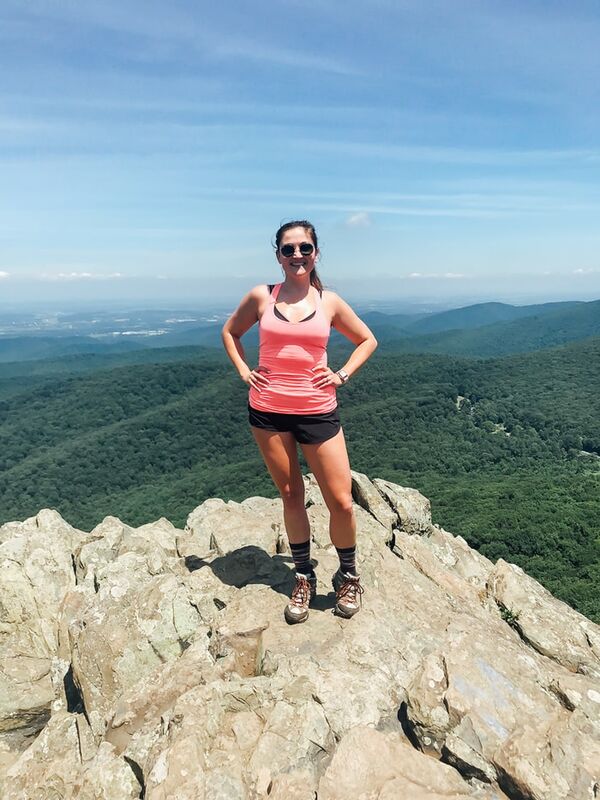 After caffinating, we headed to the Humpback Rocks trailhead. The hike is steep but only about .8 miles to the top if you take the direct route. 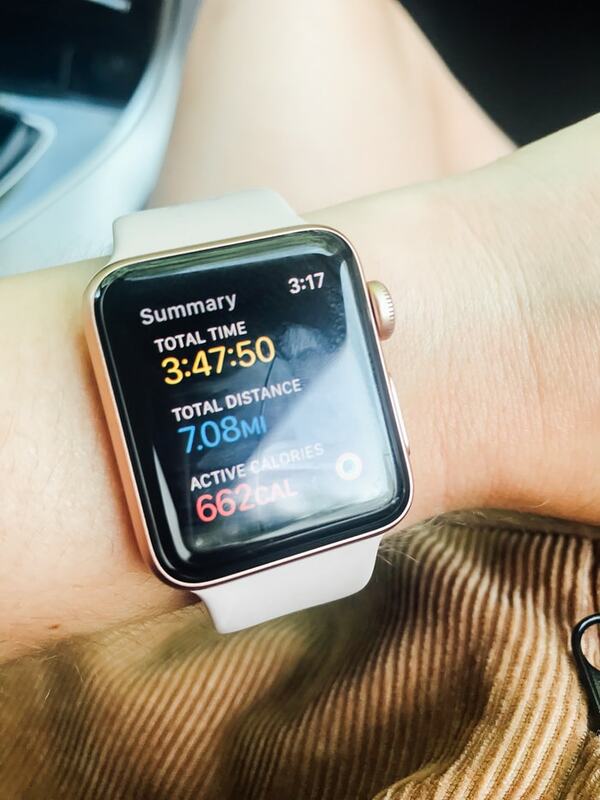 There’s also a 4-mile loop you can do, so we decided to take that for the way back. Plot twist: we ended up going the wrong way on the Appalachian Trail and wound up hiking seven miles instead of four! We also saw a bear on the hike back, which definitely put a little pep in our step. There were a ton of signs with bear warnings but we were so caught off guard and surprised when we actually ran across one. Luckily, he just minded his own business as we quickly scurried past. After hiking, we stopped by Basic City Brewery for a refreshing drink. Isaac got a beer and I ordered a local kombucha and some peanuts to snack on. We didn’t have any set plans for the evening so we ended up at Blue Mountain Brewery for dinner. The parking lot was super crowded, but we ended up being able to get a table really quickly. 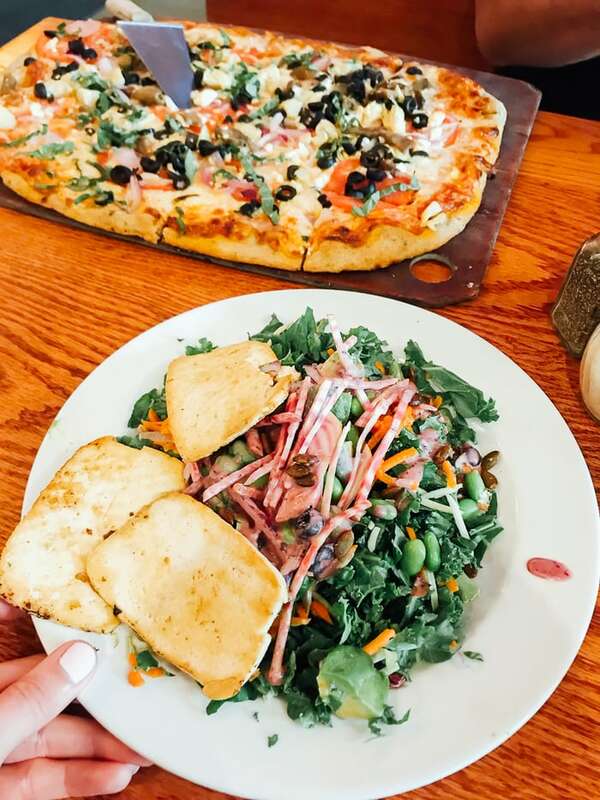 I ordered a salad with local tofu and had a slice of Isaac’s Greek pizza, which was delish and HUGE! Saturday morning we had breakfast at the Inn and then headed to Vesuvius, Virginia to take a shorter hike at a spot called White Rock Falls. 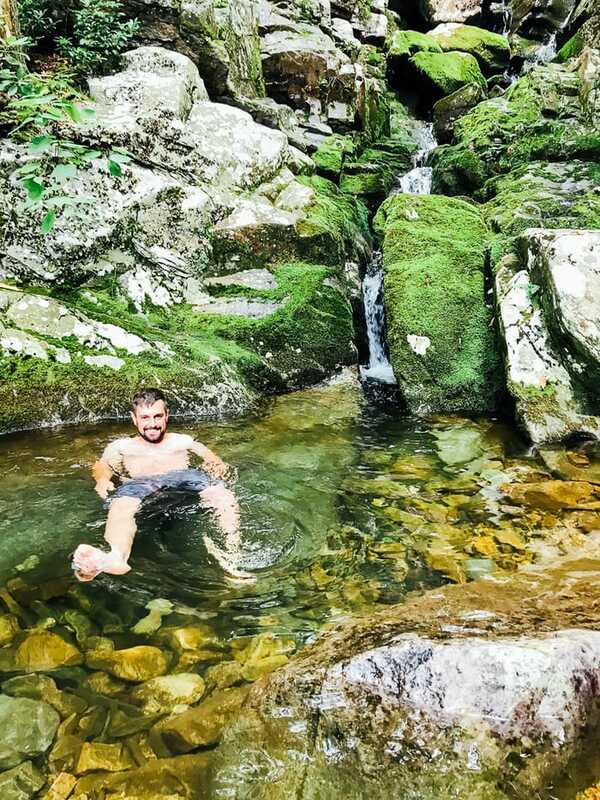 It was a little tricky to find the large waterfall (because you can only really see the trail split from one direction), but we found it and Isaac even took a dip in the little pool. Fun fact: The pool is much larger during the spring months when there’s more rainfall. That being said, the water is freezing even in the middle of summer. I felt it and that cooled me right down after hiking (and I didn’t even have to get in!). After hiking, we went back to the Inn for showers and to freshen up before an afternoon of exploring. 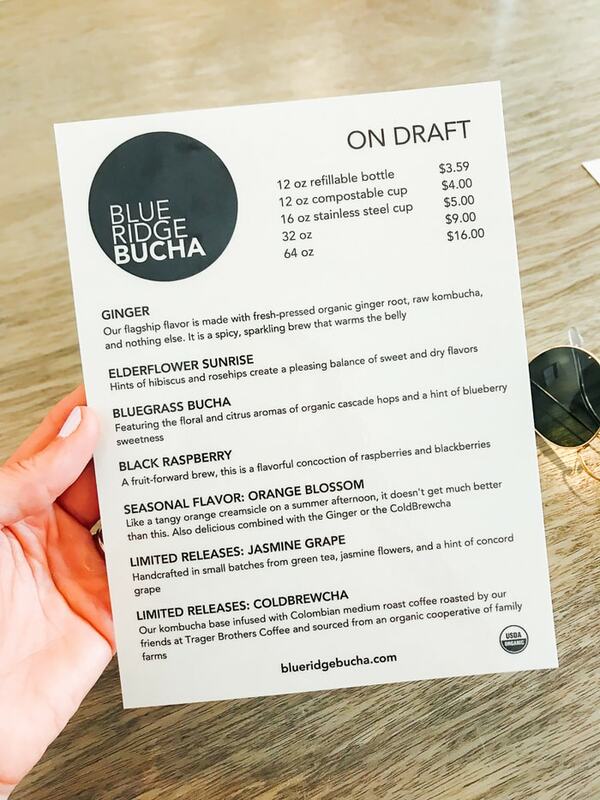 First stop — the new Blue Ridge Bucha tasting room. 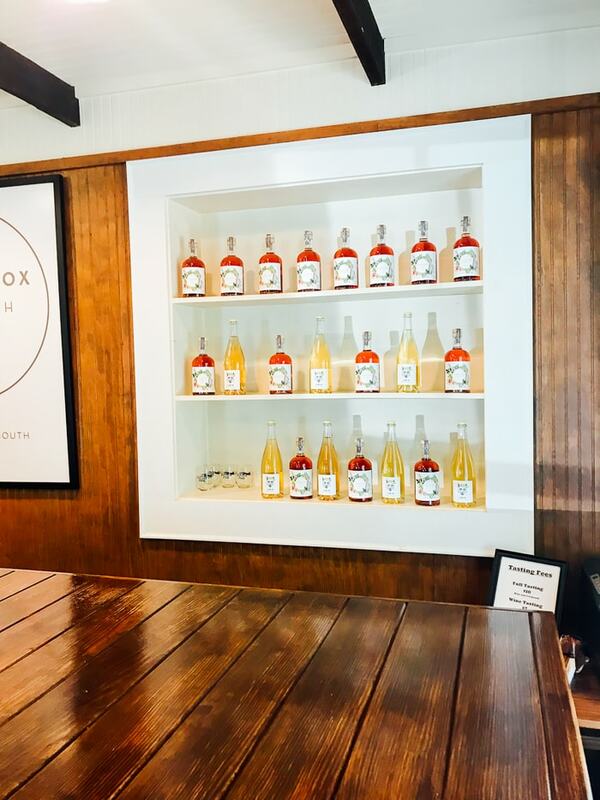 It was totally coincidental, but our weekend trip coincided with the grand opening of the kombucha tasting room so we stopped by to congratulate the owners and do a tasting. They had a few new-to-me flavors on tap, like orange blossom and black raspberry, which were both delicious! However, I have to say that ginger is still my all-time favorite. 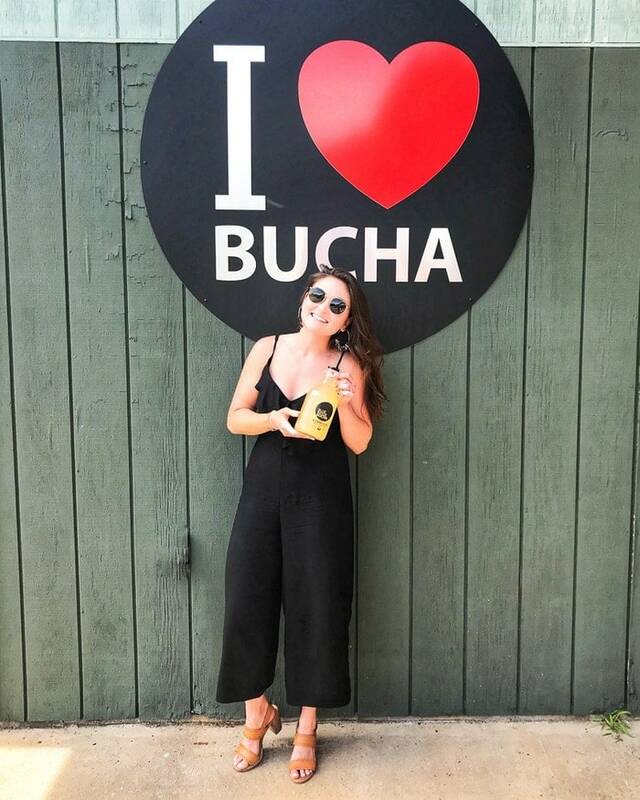 After the booch, we were ready for something a little stronger so we headed down the road (not far at all) to Flying Fox Vineyard. 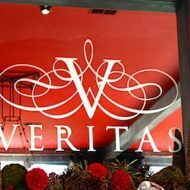 Flying Fox is connected to Veritas and has the same winemaker, but has it’s own vineyard and a small tasting room. 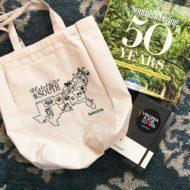 The wine is delicious and they’re also the only winery in Virginia that makes vermouth. They make seasonal varieties of vermouth and we were able to try the spring varietal, which uses locally-grown rhubarb as well as seasonal botanicals, wormwood and fresh lime peel. It’s really good and makes a great addition to cocktails! We took a bottle home and I’m already excited to try making a sparkling summer cocktail with it. 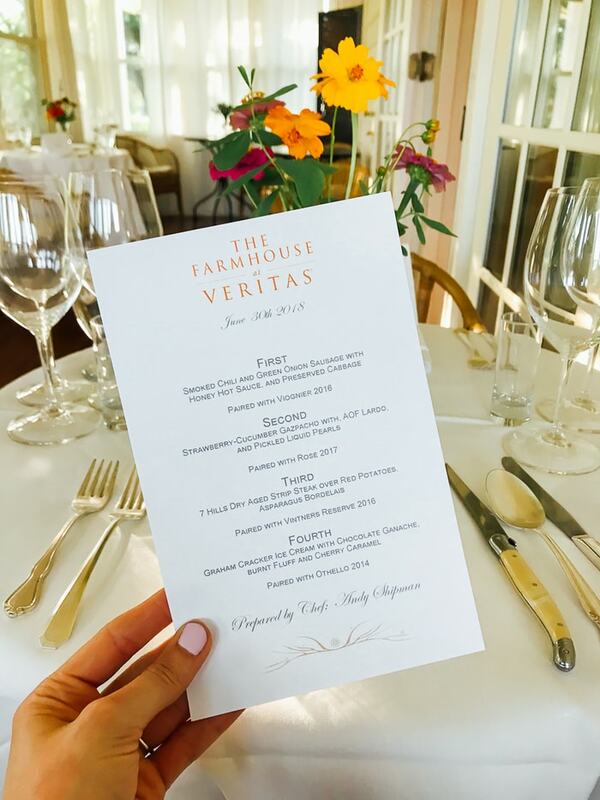 For dinner, we made reservations for the Farmhouse at Veritas. 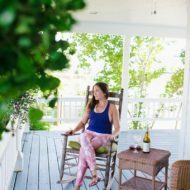 Last year, I did a yoga retreat at the Farmhouse and came home raving about all of the food. I knew Isaac and I needed to go back for dinner sometime and our anniversary weekend seemed like the perfect time to treat ourselves! 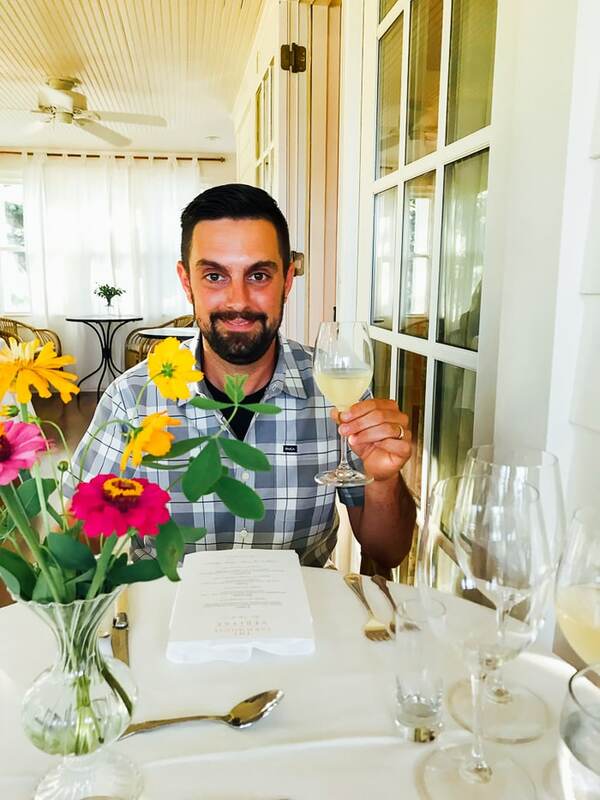 Dinners are offered Tuesday through Saturday nights, and include a four-course wine-paired meal featuring homegrown and housemade Farm-to-Fork menus (prepared weekly by Chef Andy). Dinner starts with a little bubbly and then each of the four courses are paired with a Veritas wine. What’s not to love?! We had an amazing meal — seriously we both cleaned every single plate, raved about each dish and left the Farmhouse feeling perfectly full, but not stuffed. Sunday morning we woke up, had our last breakfast at the Inn, checked out and headed to Charlottesville to explore a little more. We grabbed coffee at Snowing in Space, lunch at Red Pump Kitchen and then did a tasting at Potter’s Craft Cider before heading home. If you’re ever in Charlottesville and like cider, definitely check out Potter’s. They have some really fun varieties of cider (the seasonal passionfruit flavor is SO good) and the tasting room is very cute. Overall, we loved this weekend getaway — sometimes it’s really nice to getaway without having to go very far, and I personally love doing trips to celebrate our anniversary (rather than exchanging gifts). The older I get, the more I value experiences and memories over material things! I’ve always known that Virginia has many awesome towns to explore, and I’m excited to explore our state even more after this trip. Tell me about your last adventure in your state in the comments – I’d love to discover other fun places for future trips! 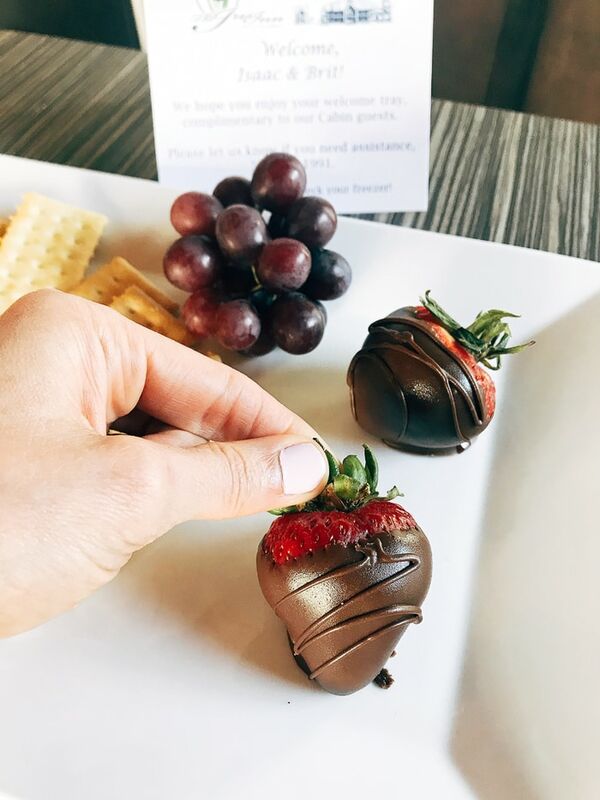 What a fun weekend away — a perfect mix of nature and good eats! Wow, sounds like a great getaway! This is exactly the kind of trip my husband and I would do. The perfect balance of exploring, nature, food, drink, and time together. 🙂 Cheers to 5 years! Looks lovely. 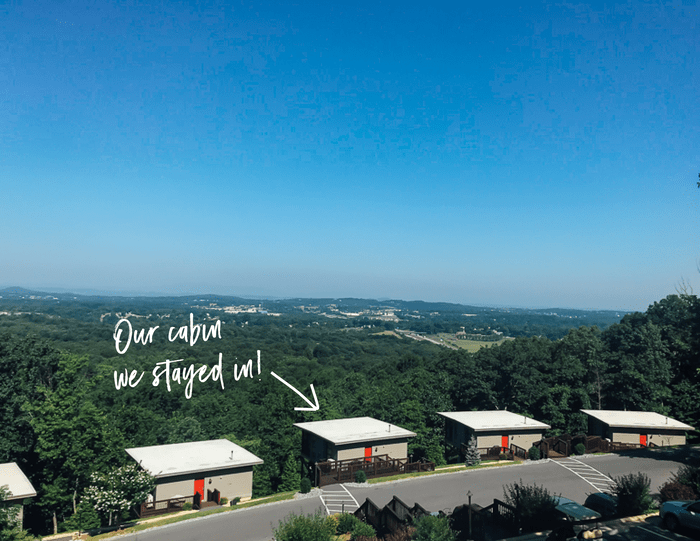 Can you recommend any other spots along the blue ridge mountains a little further north…looking for about a five hour drive from southern Illinois after we drop the kids for camp. 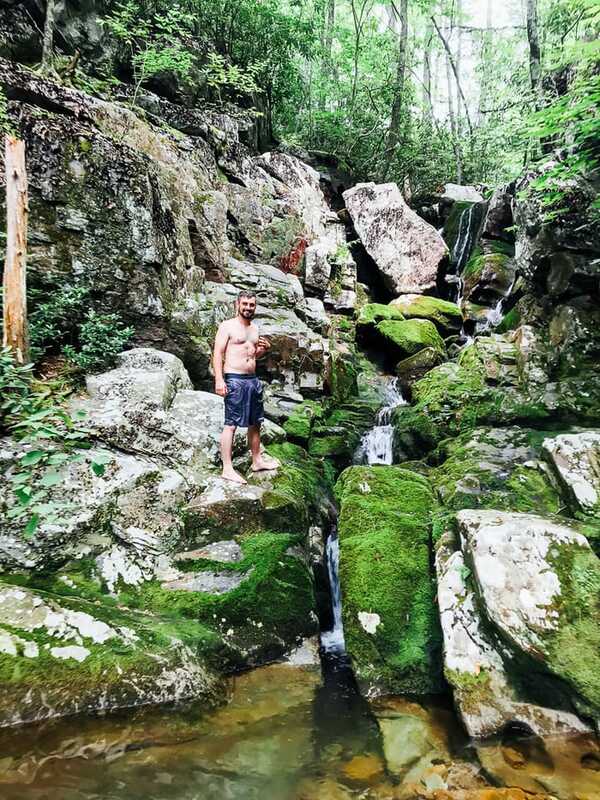 We did the smokey mountains last year – amazing! Awhhh this looks so fun and nice!! I always wanted to stay in a cozy cabin and hike somewhere beautiful like that! <3 Never heard of this place but def want to go now!! I live in Waynesboro and have really been wanting to che kouf the Iris Inn! Your cabin looked so nice. Did they bring breakfast to your cabin or did you to the Inn? I’m glad you both enjoyed your getaway!